Goal: To find out the mystery of the rune that binds him and D, and gain power and use it to stand up for good in the world. Motivation: A combination of righteous fury and passion for justice, wonder and curiosity about the rune, and a desire to repay the mysterious hero who saved him by helping that hero’s cause. Desires: To be a powerful hero like the one who saved him, to help people, and to find a wife, probably by saving her from an attacker. Formative Context: When Terryein Lennitz was seven years old, he began having dreams about a rune. This strange thing would appear in each and every dream, sometimes as a massive symbol floating in a bluish astral sea, sometimes in the background of his other dreams, and sometimes on him somewhere. As a teenager, he grew tired of the injustices he’d seen around him. The strong took what they wanted from the weak, and he watched not just bullies getting off scott-free, but also bandits robbing homes and he even heard that his distant uncle was slain. When he was fourteen, a terrifying man with a grimy knife, large stature, and a grimy knife tried to rob him, and he was scared for his life. He had no money but the mugger said if he didn’t pay he would be killed. Then a strange masked figure in a flowing cape weilding a falchion and a spiked gauntlet literally flew in and subdued the bandit. When the mugger tried to stab the hero, he found himself hit with an electrified fist and would never hurt anyone again. The mysterious figure left Terryein’s life, never to be seen again, but the mark left behind would never leave the young half-elf. Terryein grew convinced that it was up to those good men who were blessed with power to protect the world from bad men. Later, one of his classmates, a girl he had a crush on, was being harassed by what Terryein thought was a bully. Terryein thought it was his moment to be as brave as the masked figure, and stood up to the bully, telling him to back down or get knocked down. Unfortunately, Terryein didn’t know that this wasn’t just a young punk trying to push a girl around–this guy was a hardened member of an underground crime syndicate, and the girls’ family owed the syndicate money. Terryein took a knee to the chest, breaking a rib. He tried to get up and throw a punch, but instead got a dagger through the forearm, he yelled out in pain and the girl screamed and ran, before he fell to his knees. The thief pulled the dagger out of Terryein’s arm, illiciting another yell of pain, but before the thief could finish Terryein off, the rune of Terryein’s dreams appeared on his forehead. 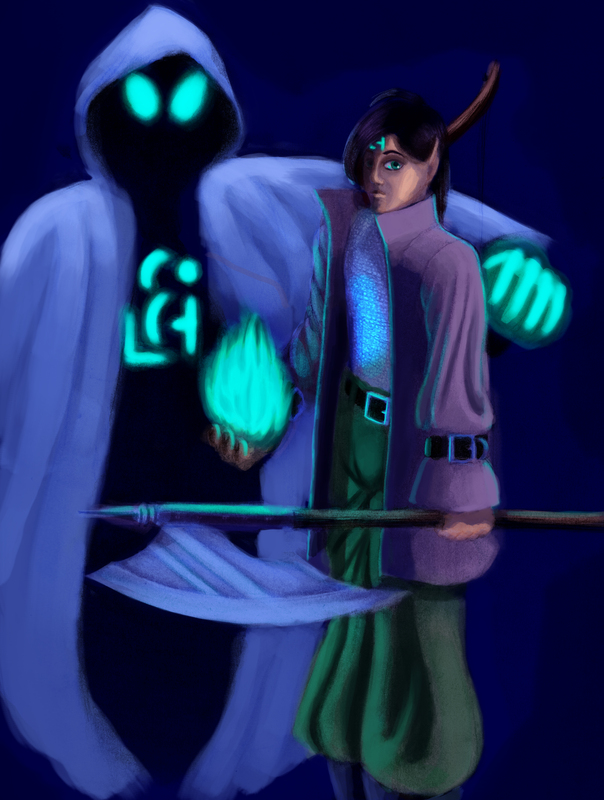 The theif stepped back, on guard, at the strange magic, and suddenly an ominous, cloaked figure, with massive, ethereally-glowing eyes and the same rune on its torso, otherwise covered in supernatural shadow, appeared between Terryein and the thief. The thief tried to cut the specter, but his arm was caught. The figure delivered a single, crushing blow to the man’s head, and the fight was over. Terryein passed out a moment later, but woke up in a hospital bed. The doctor said no one knew how he got there, but his bones were set and his wounds were bandaged. Terryein realized that unlike the hero he had seen before, he was too weak to fight criminals. And the hero had had magic. But he also wondered what the hell it was that saved him. He decided to study magic, both so that he could have the power to protect people, and also to try and find out more about the figure that saved him. Soon, he stumbled onto summoning rituals, and was able to summon the figure, whom he called “D,” by focusing on the rune. The figure told him that the two of them were somehow bound together by the rune, and when asked what it meant, D said that it described the two of their souls. Beyond that, the figure said that he was from another world, but didn’t know how to describe it and didn’t know why the rune bound the two together. The figure just knew that Terryein was important to it’s own destiny, and did not want to let Terryein die. Terryein’s fear of the unknown was overshadowed by his wonder, and the two of them became unlikely friends. Terryein decided to join a militia of some sort to gain combat training, make a living, and have the money and resources to try and figure out the mystery behind the rune, and D agreed to help Terryein anytime he summoned the specter, since D was just as curious to find out about the rune. Thus, the two began adventuring together. Setting Connection: Member of the guild. Description: A 5’6 half-elf with black hair, turquoise eyes, and an athletic build. He wears a long, lavender coat and dark green-gray pants over chainmail armor. He also carries a pack of supplies, a greataxe, and a longbow. Biggest Strength: Powerful martial skill with integrated magic abilities. Powers: Summoning, magical augmentation, other magic, and combat ability.